My little guys 2nd birthday is coming up in just 2 weeks so I've been trying to decide what type of birthday presents to get him. I already purchased this rad circus tent from Ikea but thought it would be fun to get him a few more 'entertaining' gifts since we probably won't be venturing out of the house much after baby #2 is born. We probably won't be able to hang it in the house, but one great thing about living in NM during the winter is that the weather is typically nice enough to go outdoors, as long as you bundle up! So, we might be a little too ambitious about this project, but I'm excited to give it a try. 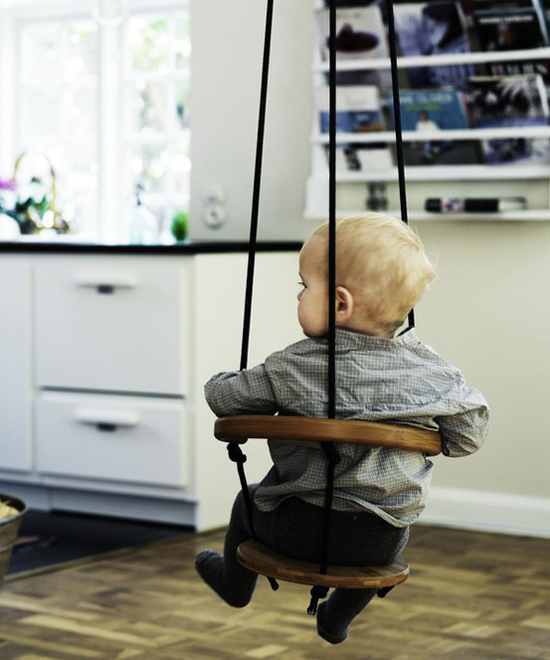 This swing is beautiful! My husband has decided he wants to get into a hobby of woodworking, so I'm mentally stashing away any and all wood projects that I'd like him to make me. This swing is one of them! oh, so great! When we get a place with a yard and tree I'm totally copying you. Love this swing!!! did you ever do this? did you post a how to?